Just criminal that this here dance floor monster was not the hit it deserved to be back in ’73 for K-Doe!! Born in New Orleans on February 22, 1936, Ernest Kador Jr.’s first public singing was in church choirs at the age of nine, and went on to sing with such spiritual groups as the Golden Choir Jubilees and the Divine Traveler. Not able to resist the pull of doo wop and R&B, he advanced his career by briefly singing with The Flamingos and the Moonglows in Chicago in the early fifties. 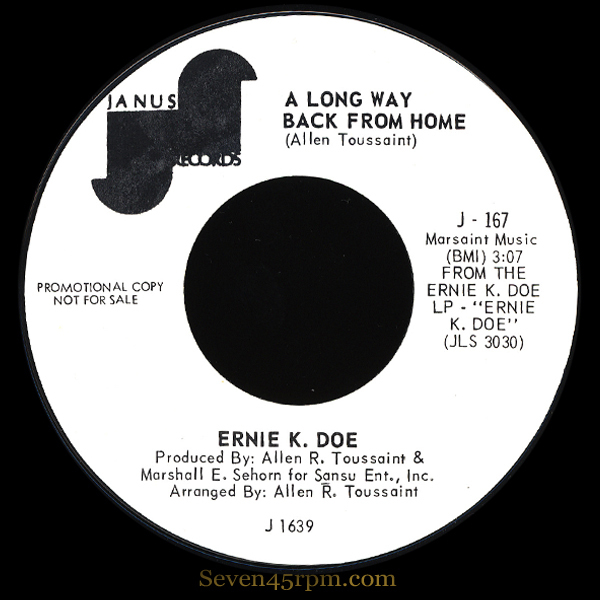 K-Doe began hanging out at the famed Dew Drop Inn and other New Orleans clubs like the Sho-Bar, and also sang briefly with a local group, The Blue Diamonds, with whom he recorded on the Savoy label. As a solo artist he signed with Herald and Specialty and released a few hits, but it was the release of Mother-In-Law in ’61 on Minit that gave him his first real taste of sucess! It reached number one on Billboard‘s R&B chart during May of 1961, and it was the young 23 year old songwriter/producer Allen Toussaint who arranged the song, with backing vocals by the great Benny Spellma. Ironically, K-Doe abandoned Mother-in-Law during rehearsal because it had not gone well. However, as Toussaint recollected in K-Doe’s obituary in the New Orleans Times-Picayune: “It found its way back out of the trash can and into my hands, so we could try again. I’m so glad we did.” Mother-In-Law was one of the biggest records to come out of New Orleans in the 60’s, selling in the millions! 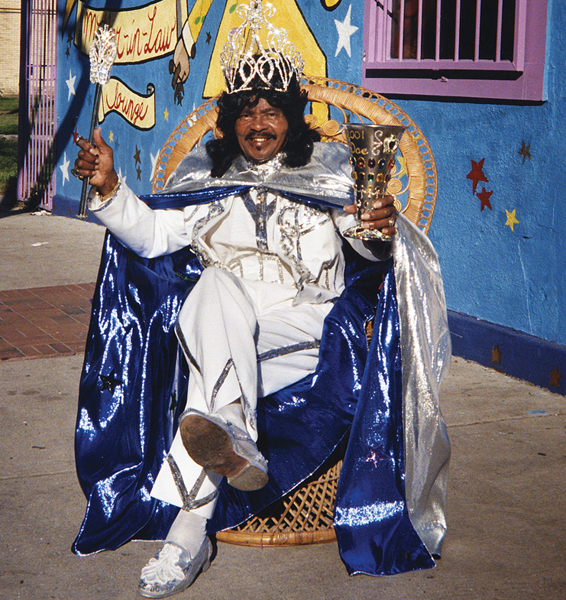 The now successful and flamboyant K-Doe went on to release a string of great tracks there after, include Dancing Man, Popeye Joe, the self penned Te-Ta-Te-Ta-Ta, and one I highly recommend A Certain Girl, which was very nicely covered by The Yardbirds in ’64 with a truly big sound. 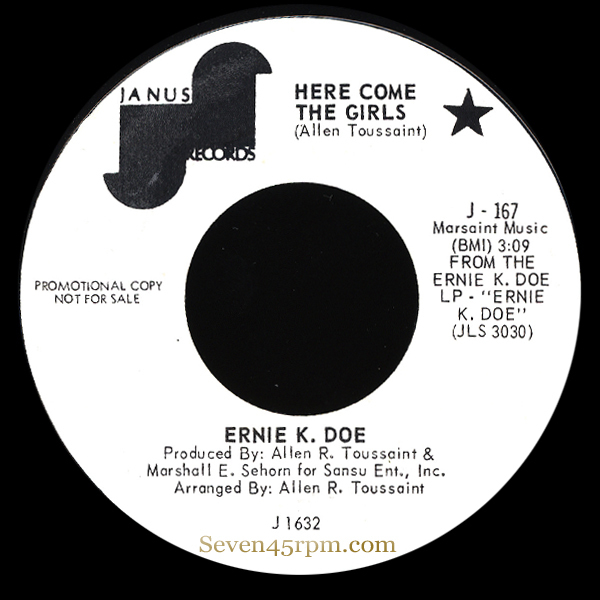 It’s 1973…K-Doe is on a new label Janus, and teams up once again with Toussaint, but this time releasing something a lot more funkier than ever before (well it was the 70’s!). 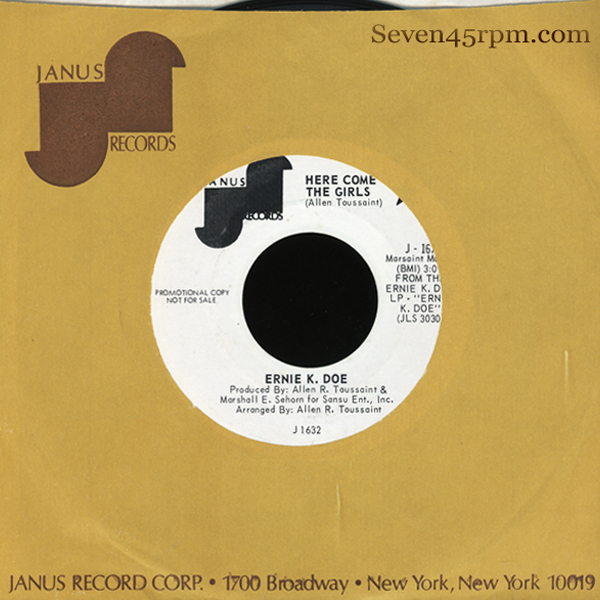 Releasing a brilliant self titled LP, with Toussaint’s session hipsters, The Meters as his recording band, and it’s the dynamite Here Come The Girls that gets the single release (the flip being A Long Way Back From Home). The moment the distinctive military intro kicks in, you are forced to attention, and quickly that melodic verse sweeps you in. Driven with that tight rhythmic Meters strumming, along with that catchy bridge and chorus, you soon realise that this is more the funk that’s definitely derived from good R&B and soul roots! It’s snappy, tight and the pace is perfect! Although this mighty tune may not have reached the success or attention of his hey day 61′ classic, or whether it even made the charts at all at the time, it’s hard to believe that it wasn’t the soundtrack to plenty of dance floor lovers of the time. It just must have been! While the great man is no longer with us, the good news is today, it’s a tune certainly on many dj’s set lists (or wish lists), and still gets a whole lot of people jivin’ 40 years later! Lots of info online on this great artist and here’s some I referenced and recommend!